Peregrines take their prey in flight, so they dine almost exclusively on other birds. However, very young falcons may catch flying insects and, occasionally, Arctic peregrines will catch and eat ground-dwelling animals like lemmings. Male peregrines, which are substantially smaller, will generally catch smaller birds, but females will take larger prey like ducks. Peregrines can eat as much as one-quarter of their weight at one sitting. 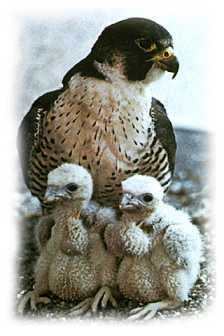 Peregrines usually begin breeding at about 2 years of age. The male will put on an aerial courtship display to attract a mate to a selection of nesting sites. The female chooses. Peregrines generally mate for life, returning each year to the same area and even the same nest. However, the female will accept a new mate if the first is killed. Theres nothing fancy about the nests. The nest, "scrape," is traditionally no more than a depression in a cliff ledge. But nowadays, possibly in response to increased human contact during captive breeding projects, many peregrines find homes in man-made structures and more populated areas, using power plant smokestacks, steeples, tall buildings and bridges. Females lay a clutch of 3 to 5 eggs in the spring. The eggs range in color from pink to brownish and are about 2 inches long. It takes about a month before the eggs hatch. Newly hatched peregrines, weighing in at about 1.5 ounces, double their weight in just six days and and increase tenfold by three weeks. Hatchlings are covered with fluffy white down, replaced by feathers in 21 to 35 days. Peregrines first fly 35 to 45 days after hatching, when they have reached adult size. They begin to hunt around 60 to 80 days. The mortality rate is very high for young peregrines. Only one in 10 makes it to breeding age. They can live for up to 15 years. Peregrines are found all over the world except in Antarctica and the Pacific Islands. The most common subspecies in the United States, falco peregrinus anatum, is found from central Alaska to central Mexico and usually winters in South America. A maritime subspecies, Peales peregrine, found in the Northwestern U.S. and north, does not migrate. Generally, the birds head south in September and may spend a month to reach their winter homes in Central and South America. Arctic peregrines have been seen as far south as Argentina. Some urban peregrines do not migrate anymore, since their prey  pigeons and starlings  remain abundant year round.